With the basics of the Firebase Realtime Database covered in the previous chapters, this chapter will step through the creation of an Android Studio project that makes use of the realtime database to store data. The app created in this chapter will demonstrate the key elements of the Firebase Realtime Database, including reading and writing data, implementing database rules, adding a data change listener and the separation of user data using Firebase user ids as node keys. The example app created in this chapter will require the user to sign in using Firebase email/password based authentication. Once authenticated, the user will be able to enter text into an EditText field and store that text in a realtime database tree. Database rules will also be declared to ensure that the data is readable by all users but writable only by the owner, and to validate certain aspects of the user’s input. 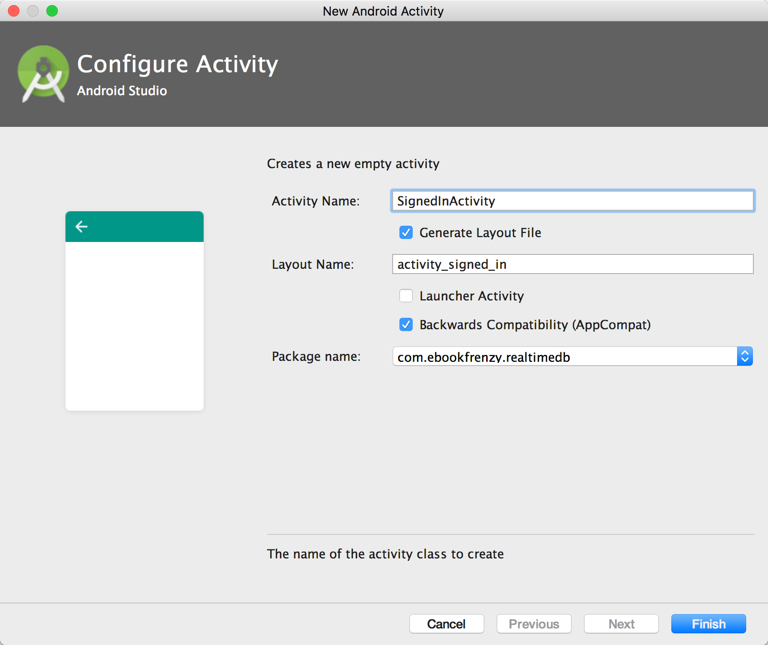 Launch Android Studio and select the Start a new Android Studio project quick start option from the welcome screen. Within the new project dialog, enter RealtimeDB into the Application name field and your domain as the Company Domain setting before clicking on the Next button. On the form factors screen, enable the Phone and Tablet option and set the minimum SDK to API 16: Android 4.1 (Jellybean). Continue to proceed through the screens, requesting the creation of an Empty Activity named RealtimeDBActivity with a corresponding layout named activity_realtime_db. As previously outlined, access to the data stored by this app will only be available to authenticated users. Though only email/password authentication will be used in this project, the mechanism for accessing the user’s data are the same regardless of choice of authentication provider. Begin the authentication implementation process by opening the Firebase console in a browser window and selecting the Firebase Examples project created at the beginning of the book. Navigate to the Authentication screen, select the Sign-In Method tab and enable the Email/Password provider if it is currently disabled. Return to the project in Android Studio and select the Tools -> Firebase menu option. When the Firebase assistant panel appears, locate and select the Authentication section and click on the Email and password authentication link. In the resulting panel, click on the Connect to Firebase button to display the Firebase connection dialog. 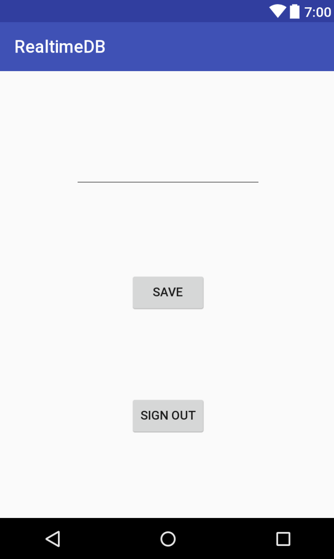 Choose the option to store the app in an existing Firebase project and select the Firebase Examples project before clicking on the Connect to Firebase button. With the project’s Firebase connection established, refer to the Firebase assistant panel once again, this time clicking on the Add Firebase Authentication to your app button. A dialog will appear outlining the changes that will be made to the project build configuration to enable Firebase authentication. Click on the Accept Changes button to implement the changes to the project configuration. Since this project is going to make use of the FirebaseUI Auth API, two more dependencies need to be added to the module level build.gradle file for the project. Within the Project tool window, locate and double-click on the build.gradle (Module: app) file so that it loads into the editor. The RealtimeDBActivity class will be used to authenticate the user. Once the user has signed in to the app, a second activity will be launched to present the user interface within which the user will enter text and save it to the database. Before clicking on the Finish button, make sure that the Generate Layout File option is enabled and the Launcher Activity option disabled. The user interface for the second activity is going to consist of the Plain Text EditText view into which the user will enter text together with two Button objects. Locate the activity_signed_in.xml file, load it into the layout editor and turn off Autoconnect mode. With Autoconnect mode disabled, drag and drop the three components from the palette onto the layout canvas so that the layout resembles Figure 24-2. 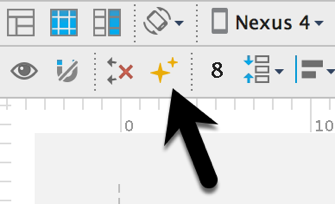 Note that the text properties on the two buttons have been changed to “Save” and “Sign Out” and that the text property on the EditText view has been modified to remove the default “Name” string. With the views positioned and configured, click on the Infer Constraints button (indicated in Figure 24-3) to apply appropriate constraints to the layout. Edit the onClick properties for the two buttons to call methods named saveData() and signOut() when clicked by the user. Finally, select the EditText view and change the ID to userText. Before code can be written to make use of the realtime database some library dependencies need to be added to the build configuration. To add Firebase realtime database support, select the Tools -> Firebase menu option and click on the Realtime Database entry in the resulting Firebase assistant panel. Once selected, click on the Save and retrieve data link. In the next panel, click on the Add the Realtime Database to your app button. A dialog will appear listing the changes that will be made to the project build files to add realtime database support to the project. Review these changes before clicking on the Accept Changes button. The onDataChange() listener method will be called when the data stored at /data within the database tree changes and is passed a DataSnapshot instance containing the data. The code within this method extracts the String object from the DataSnapshot instance located at the <user id>/message node. This string is then assigned to the EditText field so that it is visible to the user. With coding work complete, the next step is to configure the database rules. The requirements for this app are that any user can read another user’s message text, but only the owner of the message can write to it. ".write" : "auth != null && auth.uid == $uid"
As declared, the /data node of the tree (and all of its descendants) is readable by any user. A second rule is then declared for the user ID node allowing only the owner of the data to perform write operations on this or any child nodes. Remaining in the console window, select the Data tab to display the database tree for the project. Launch a second instance of the app on a simulator session and sign in using the same account credentials created above. Change the text in the text field, click the Save button and note that the instance of the app running on the device changes instantly to reflect the new text. Try changing the text within the two instances of the app and verify that a text change in one app is not reflected in the other app indicating that the data is now separated based on user ids. With the changes made, click on the Publish button within the Firebase console to activate the rule changes and then test the app once again. When attempting to save a string that exceeds nine characters in length, a message should now appear indicating that permission has been denied. This chapter has demonstrated the combination of the Firebase authentication and realtime database features to store and access data assigned to a specific user. This includes the integration of database and authentication support into the Android Studio project and the implementation of code to store data and receive realtime notifications of data changes. The example project also made use of Firebase database rules to restrict data access and perform data validation. This page was last modified on 30 August 2017, at 17:39.